Always conscious of the needs of others in our community, the Carson team chose to participate in The Julian Center’s Holiday Adopt-a-family. All of our employees at Carson helped to contribute, shop and deliver clothes and gifts for a family this Christmas. Carson Sirens is proud to introduce the updated SC-407-20 14 Enforcer full featured light control siren. This faithful standard received a face lift and some internal updating to make it as competitive as the rest of the stable of rugged and reliable sirens Carson Manufacturing Company, Inc. has become known to manufacture. Traditional rotary switch siren control knob and rocker switches with the 20 amp circuits for primary light control make this unit an easy choice for the economical buyer in need of a light control siren. New blue LED backlighting for operator visibility at nighttime. As we move into the Holidays all of us here at Carson shared our thankfulness with others and supplied food to two families in need. Along with a Thanksgiving feast we also provided them with additional food to fill their pantries. Carson Sirens is proud to introduce the new SC-411 Elite Force handheld controller to the series featuring QuickClone® duplication technology making it an easy and ideal application when you need total control right in the palm of your hand. Select between the handheld dual tone model, requiring 2 speakers, or the 100/200 watt single tone handheld controller. Don’t be fooled, this series is small in size, but large on functionality. Rugged and reliable is the reputation that Carson Sirens has come to be known for and this series does not disappoint. 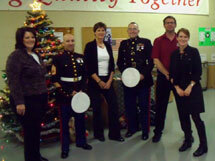 The Carson Manufacturing Team, along with the NAFA Tri-State Chapter, stepped it up this year when taking part in the US Marine Corp Reserve “Toys for Tots” program. The employees out did themselves, over flowing a large 42″ x 42″ x 46″ box with assorted toys and games. Our Customer Service and Technical Support departments always enjoy receiving pictures from customers when they have used our sirens in unique or creative situations or just as we have designed them. Sometimes our customers surprise us how imaginative they can be installing our siren units. Maybe one of these pictures will help you to think “outside the siren” on an application. The SA-361-22AMP is now available for use on Motorcyles, ATV’s and Off-road Vehicles. This amplifier has been stabilized and conformal coated to reduce the risk from vibration and elements from the weather. Amplifier should be shock mounted and installed in hard saddlebag or equivalent. Waterproof motorcycle rated switches are recommended. The Carson SA-361-22AMP is small, effective, reliable and affordable. Carson Sirens is proud to introduce the new SC-411 Elite Force siren series featuring the new QuickClone™ duplication technology making it an easy and ideal application for fleets. Select between the remote dual tone model, requiring 2 speakers, or the 100/200 watt single tone remote unit. Don’t be fooled, this series is small in size, but large on functionality. Rugged and reliable is the reputation that Carson Sirens has come to be known for and this series does not disappoint. Carson Sirens announces the release of its SA-385 Alert siren. This rugged, no-nonsense model replaces the popular SA-380 Alert, but will continue its industry-leading legacy with a new look and improved features and functionality. The new Alert incorporates the same full-featured siren options as the original SA-380, with added features designed to enhance operation and increase ease of installation. These features include making Instant-On operation a standard requiring no enable input; terminal block wiring which offers simple, plug-in connection; and a significant reduction of the internal electronics footprint giving the SA-385 a much smaller chassis size. Carson Sirens announces the release of its NEW SA-365 Defender siren. At first glance, you might notice that the SA-365 closely resembles the existing Carson SA-360 Defender. The SA-365 has, in fact, replaced the SA-360, but has not replaced the features and functionality that made it an industry leader. Where the similarity ends between the two models is in chassis size. The SA-365 has been engineered with a reduced internal electronics footprint, resulting in a chassis that is almost 50% smaller than that of the SA-360. Additional features include removable terminal block wiring for simple, plug-in connection to the amplifier, and external DIP switches for easy siren customization. Carson Sirens is proud to introduce the new H-Series electronic “stutter” air horn line of audible warning products. This line features LOUD and LEGAL*, professional grade products that incorporate the power of a simulated “stutter” air horn with auxiliary light control and the reliable Carson quality not found in other aftermarket horn products. The H-Series was developed to enhance emergency light packages in volunteer firefighter personally owned vehicles (POV) by offering a legal* audible warning solution to those volunteers that work in states that restrict siren use. The SA-361 Defender remote siren (SA-361-10 14) has been redesigned with a new look and added functionality! The improved Defender combines the same simple operation, reliable performance and fullfeatured siren options as the original SA-361, but in a smaller, more compact amplifier. Size and user-friendly serviceability were the motivating factors in the redevelopment of this industry favorite. These key factors were achieved through the addition of terminal block wiring, which offers simple, plug-in connection to the amplifier; and the reduction of the internal electronics footprint resulting in a smaller amplifier with more versatile installation capabilities. The rugged SA-361 Defender remains the affordable choice for law enforcement, security, and volunteer firefighters. The model number for the new SA-361 will be SA-361-20 14. This model number should be referenced when placing orders or making product inquiries. Please note that the SA-361-20 14 will replace the current SA-361-10 14 model. The SA-361-20 14 will be available for sale starting in April 2010. Carson Sirens announces a new addition to its speaker product line, the CSP-100B Basic Speaker. This rugged, 100 watt speaker offers a new category of “economy” speaker to compliment the existing premium models currently available in the Carson line. Powerful and compact, the CSP-100B is the smallest “behind-the-grill” speaker on the market today offering easy, versatile installation on any vehicle. The CSP-100B is constructed of black, corrosion-resistant metal giving it the strength and durability necessary to perform in even the worst conditions. It’s a “basic”, no-frills speaker that is loud, reliable and inexpensive making it an ideal option for volunteer firefighters and individuals looking for a quality speaker at a low price. Carson Sirens will exhibit at some of the largest industry tradeshows during the 2018 tradeshow season. Following is the list of tradeshows, locations and dates that Carson Sirens will be on exhibit. Please make plans to stop by our booth and visit with Toni Woodard, our Sales Director. We look forward to seeing you there.